How high are realtors' and lawyers' fees in South Korea? What about other property purchase costs? 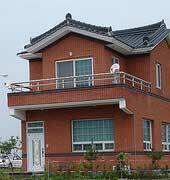 How difficult is the property purchase process in South Korea? Upon conclusion, a property sale contract must be recorded by the foreigner to the head of the Shi/Kun/Ku (city/county/ward). If the property is located in military installation protection areas, designated cultural properties, and ecosystem conservation areas, foreigners "shall obtain permission from the head of Shi/Kun/Ku before the conclusion of the contract" . However, remittance of revenue or profit from property in Korea is not allowed. A foreigner who wants to enjoy rental income has two options. One is to establish a 'stock company' or corporation (Joosik hoesa), which is the same as a U.S. stock company. A foreigner can purchase the property through the stock company, and then remit the revenue out of the country in the form of dividends. The minimum capital required for a 'stock company' is KRW50 million (US$45, 045), and each share must have a minimum par value of KRW5,000 (US$5) for it to be sold without court approval. Another way is to register a 'limited liability company' (Yoohan hoesa), and pay the tax before remitting the money. The minimum capital required for a 'limited liability company' is KRW10 million (US$9,009). A 'limited liability company' cannot have more than 50 partners. This issue of remittance is one reason why foreigners tend to hold Korean property through a 'stock company' or a 'limited liability company'. Nonresidents can open Korean Won bank accounts only for a limited range of purposes, which includes withdrawing Korean Won after depositing Korean Won acquired in Korea. However, individual and corporate residents can hold unlimited amounts of foreign currency in local foreign-currency bank accounts. A real estate agent should be sought. His services will include the transfer and registration of ownership. It is possible to obtain a contract in English. The title should then be checked. Title to real estate is evidenced by registration at the Real Property Registry. Under Korean law, buildings and land are owned separately. Therefore, there are separate registries for buildings and land. The Real Property Registry has some inherent limitations. For example, it does not show whether there has been a break in the chain of title caused by acts such as a forgery of the rightful owner's seal or an unlawful sale of the property by a third party. The occupant is the registered title holder at the Real Property Registry, has occupied the premises for at least ten years and took possession with the intention of owning the real estate. The occupant must take possession peacefully and publicly, and with the belief that it has the legal right to possess the real estate. If, however, the occupant mistakenly believes through negligence (for example, by failing to check the Real Property Registry upon occupancy) that it has the legal right to real estate, it may not take adverse possession. The occupant has peacefully and publicly possessed the real estate for 20 years with the intent to own it and with the belief that it has the legal right to possess the real estate, and after the 20- year period, it has registered itself as the owner. Encumbrances, including mortgages, easements, superficies, registered leases, trusts, and judicially-ordered attachments and injunctions. The appropriate authorities must be notified of the intention to make a foreign direct investment (FDI). This should be done at the head-office or branch of a domestic bank, branches of foreign bank, or KOTRA (including its overseas and domestic offices). A FDI company registration should be sought from the agency accepting notification, within 30 days from completion of capital of investment object introduction (Requirements: * Application for FDI company registration; * Certificates confirming purchase (deposit, etc.) of foreign currency ( in case of FDI-in-kind introduction, certificates confirming the completion of FDI-in-kind by KISC); * Copies of company registration at Korean Court registry (in case of personal business, certificate of business registration at tax offices). Then a contract should be signed, and a transcript of the real property registration obtained. Land Acquisition Filing must be done within 60 days after closing (payment in full) of contract at the Cadastral Division, City, County of Ward Office (Autonomies) of the place of land (Requirements : A real estate acquisition contract and a transcript of land registry). Strictly speaking, a parcel of land is legally distinguished from real property, but traditionally a building isn't normally traded apart from its land in Korea. Therefore a 'Land Acquisition Filing' is usually needed in case of purchasing a house (incl. Apartment), factory, or commercial building). It is recommended that professional legal services be obtained, because of the complex requirements. A Business Registration should be lodged (where a local corporation is being formed to hold the property) at the national tax authority with jurisdiction over the place of real property, KOTRA (Requirements : * Business registration application form; * Certificate of FDI notification; * Notarized certificate of representative of individual with power of attorney (In the case of a corporation, business registration is normally done at the time of incorporation). Then a request should be made for Foreigner Registration No. for real estate registration, for an individual, at the Seoul Immigration Office (in Mok-dong : Tel. 82-2-650-6237), and for a corporation, at Cadastral Division, City, County or Ward Office of the place of real property (to give your representative a mandate, attach a power of attorney notarized by the public notary of one's homeland (foreigner) or the consulate in the country of residence (Korean resident abroad). South Korea uses South Korean Won. Exchange rate is at US$1 = KRW1,002.10 as of 26th June 2006. Value Added Tax (VAT) is levied at a flat rate of 10%. Buyers are required to purchase National Housing Bonds at a rate of about 5% of the purchase price of the real estate. In practice, these bonds are immediately sold at a discounted price of 10% - 15% less than the purchase price of the Bonds. Legal fees are around 0.25% to 1% of the property value. A typical lawyer will charge between 5 and 10 hours to prepare the sale agreement at the rate of between KRW100,000 (US$90) and KRW 250,000 (US$225) per hour of work. Registration tax for acquisition of rights by purchase is 3%. Real estate agent's fees are generally around 0.20% to 0.90% of the property value. 20% of the registration tax. Stamp duty is around 0.20% of the property value. The special tax for rural development is around 10% of the acquisition tax. IT is also known as Agriculture and Fisheries Tax. How landlord-friendly is the law in South Korea?